Developers Hunted Cow Studios and HexWar are happy to announce that Ancient Battle: Rome, the first in a new series of hex-based wargame simulations covering the Ancient Era, is now available on the App Store for a special promotional price of $1.99 through Sept. 12 (regular: $3.99). Ancient Battle: Rome includes six mini-tutorials for newcomers and two expansive campaigns, each featuring eight battles between ancient Rome and its many enemies. 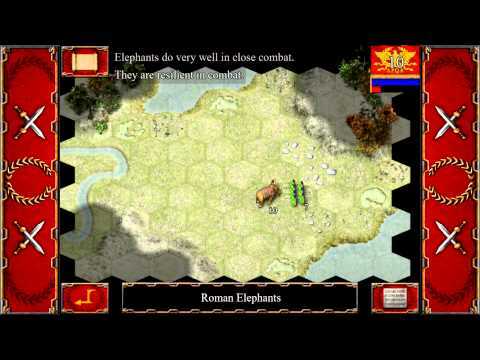 Players assume command of Roman legionaries and 29 other units such as elephants, catapults, heavy and light cavalry, archers, slingers, fanatics, chariots, and more for deep, strategic turn-based gameplay. A winner of the Ancients competition at the World Wargaming Championships helped design Ancient Battle: Rome’s unique system. The initial release features “Caesar’s Campaign in Gaul,” which culminates in the siege of Alesia, and the campaign between Julius Caesar and Pompey the Great. These battles transport players to Gaul and Italy. Those who seek more glory can purchase the invasion of Britannia, where Queen Boudicca died at the battle of Verulamium, and the Roman massacre in Teutoburger Wald in Germania. Each provides a full eight missions, and both sides are playable in every one of Ancient Battle: Rome’s campaigns. Ancient Battle: Rome also proudly introduces Combat Analysis, a new feature that helps newcomers understand the basics and veterans maximize their strategy. Players can turn off this option in the settings or leave it on to view helpful combat factors as they make critical combat decisions. Hunted Cow will later release additional campaigns: the Pontic campaign against Mithridates the Great and the Parthia campaign, where an entire Roman army perished in the desert. Players will be able to control fully armored cataphracts, light cavalry archers, scythed chariots, and the Greek Pike Phalanx. Hunted Cow Studios and HexWar are the developers behind the top-selling iOS titles like Tank Battle: North Africa, Civil War: 1863, and Tank Battle: 1944.